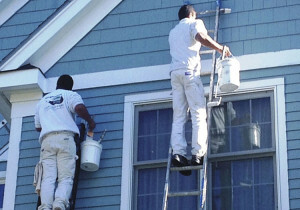 Exterior painting services of any place, house, building or commercial area is very important. It gives you the first impression of the place and your mind decides whether to enter that place or not. 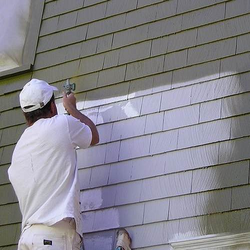 Our Exterior painting services of the place give the impression of the place as well as what that place is used for. Exterior painting services are as important as interior paints and help you create an image about your house, building or commercial areas. These Exterior painting services help to gain attraction as well. Samraa Maintenance provides the widest range of Exterior painting services and our professional painter’s deals in residential and commercial clients. – Exterior paints help in the repelling water, rain, and snowfall from the exterior walls of the place. It also helps the exterior of the building in resisting dirt, pollution, and other climate changes. – Exterior paints help in increasing the durability of the walls and building. – It helps in preventing termites and bacteria from developing on the wall. – It gives a subtle look to the walls. – So, It prevents pollution and wall damage. – It helps in reducing heat in the house as well as prevents sun damages. – It helps in building the exterior design of the house or building. – Weather and climate conditions of the area you live in. – Heat and humidity conditions of the city. – Rain or snowfall conditions of the area. – Pollution, dirt and wastage disposal around your house.